Significance: Kunnakkudi is noted for its beautiful hill temple dedicated to Shanmuganathar. The name Kunnakudi is derived from the sacred Kunru(hill) housing the temple. Kunnakkudi is also known as Mayuragiri, Arasavanam and Mayuranagaram. Kunnakudi is located at a distance of 14 kms from Karaikudi. Located in the vicinity is the Tevara stalam Thiruppattur and the famous Karpagavinayakar Temple at Pillayarpatti. This temple has been revered by the Thirupugazh hymns of Arunagirinathar. Legends: Legend has it that Vishnu and Bhrama once paid a visit to Skanda - at which time, the peacock mount of Skanda behaved with arrogance towards the guests. Skanda cursed the peacock to turn into stone. 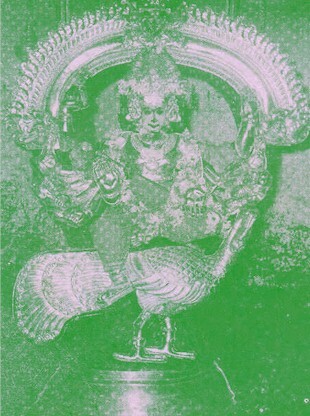 This peacock manifested itself as a hill and carried out penances towards Skanda, after which it was restored to its original form. Part of the rock is said to remain as Mayuragiri or Kunnakkudi, enshrining Skanda. The Togaiyadi Vinayakar shrine is located at the foot of the hill. A flight of steps leads to the top of the hill. There is a shrine to Idumban enroute to the hill temple. The Kunnakkudi temple was built by the Marudu brothers of this area (Sivaganga Samastaanam), who are also associated with the major Shivastalams in this area. Deities: The presiding deity is the six faced Shanmugar mounted on his peacock flanked by Valli and Deivayanai. The sanctum faces the east. To the south of the sanctum is the impressive Alankara mandapam enshrining the festival image of Shanmugar. There are also shrines to Vinayakar, Kuzhandai Vadivelar, Meenakshi Sundareswarar, Dakshinamurthy, Natarajar, Chandeswarar and the Navagrahams. Images of Veerabahu and idumban are also seen at this temple. Much of this is a rock cut temple. There is a cave temple dedicated to Shiva with a 5 tiered Gopuram at the foot of the hill. This cave temple is of great archeological significance. There are three caves here, dating back to the 8th century CE. There are three caves here. The first enshrines a Shivalingam. One of the walls bears a sculptured image of Vishnu, while the other bears an image of Lingapurnadeva, being worshipped by Bhrama (with a miniature swan above him) and a four armed Vishnu bearing a conch and discus. Also carved here are images of Durga and Harihara bearing attributes of both Shiva and Vishnu (as in Pillayarpatti). There is also a brilliant sculpture of Nataraja in this cave temple in addition to image of Vinayaka and Subramanya. Festivals: Six worship services are offered each day here. The annual festivals are celebrated during Thaipoosam and PanguniUttiram. Many devotees circumambulate the hill during these occasions. Mondays, in the month of Karthigai are considered sacred here.